Included with our keys there was a new card with various info sections. Nice, now if the properties will adopt this, and maybe even add what Welcome Gift was chosen? Ahh nice! Looking forward to getting one next month! This is all on the system and on the app... I guess given the state of the IT systems, paper might not be the worst idea. My understanding is that's the info the FDC puts in the key card holder for the mobile check-in & provides the FDC w/ necessary info. It has more info on it than the card tucked into the mobile check-ins pre-Bonvoy. Not sure it's meant to be handed over to the guest, as really it's a cheat sheet for the FDC But yeah, the more info to the FDC the better! I don't get it. What's the point of having more paper? Aren't we in the mobile/digital age? Antarius and longtimereader firstimeposter like this. LOL @ comments... Marriott: D*md if you do, D*md if you don't. I have no issues with the paper card that is in my key "package" when I arrive. There was one before this one. I don't know what it looked like. There was one for the years before that one. I don't know what they looked like either. You shouldn’t have gotten that. It is to be removed before giving you your key. JBord and hockeyinsider like this. Yep. I have seen those for quite some time. FDC uses it to verify some info on mobile check ins, then is supposed to retain it when handing over the keys. 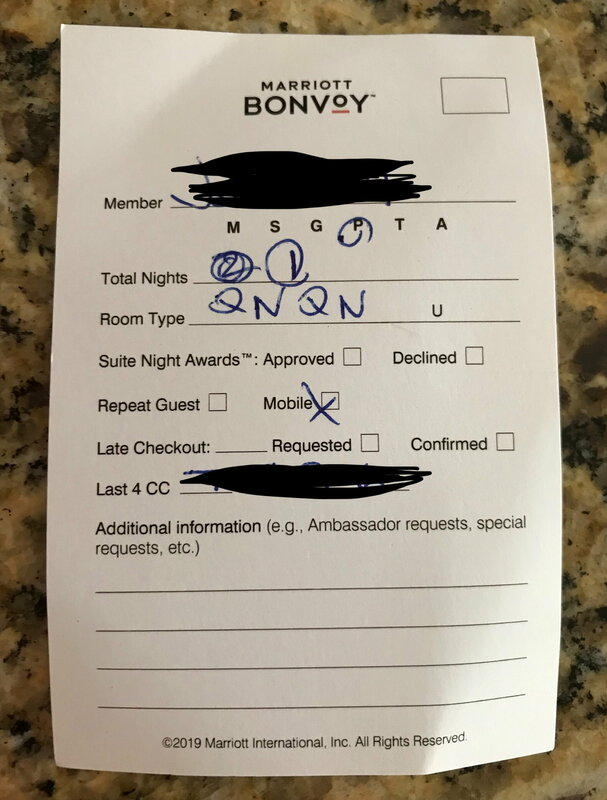 Now are those filled out in the morning before guests arrive or they fill them out when you check in? They are filled out when the mobile check in is processed...before the guest arrives. It is a "shortcut" so the FDC doesn't have to check anything on the computer. Just to confirm, you wish to leave the room charged to the credit card ending in XXXX, and you would like points for your arrival gift? Then hands over the keys, but keeping the little piece of paper. Room Type "U" (uncircled in this instance) = (Not) Upgraded ? So unless you check in on the mobile app they won't fill that out? I always ask for a upgrade in person and most the time I am granted it since I am ambassador so seems like it wouldn't be worth it to me.